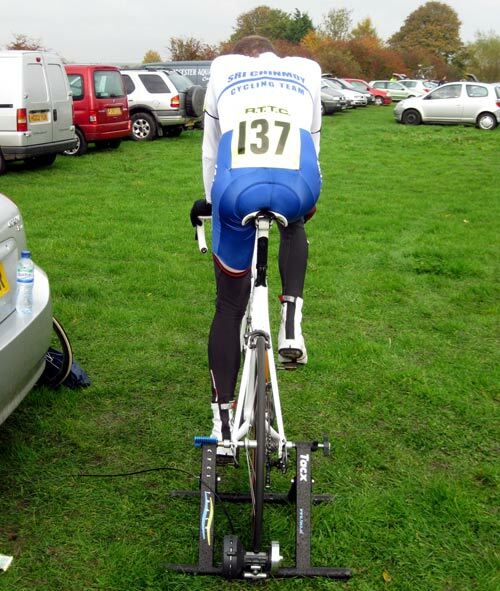 When I began my season of proper racing back in 2005, I bought a turbo trainer. It was a bit like a rite of passage, akin to shaving the legs. Only proper cyclists would buy a turbo trainer, you have to be pretty serious to spend a lot of money on something which involves getting very sweaty cycling to nowhere – driving you as crazy as the proverbial hamster on a hamster wheel. I felt like I’d done the right thing to spend £100 on a turbo trainer. The only problem is I could never bring myself to ride it. Of course, after buying, I did try 30 minutes on the turbo, but I then did one of those turbo interval sessions, where the interval of rest is about 12 months. If the weather was bad, I simply didn’t ride or I’d prefer to go out and get wet. The great Emil Zatopek said training in the rain is good character building. I took this as a noble excuse to avoid the turbo. It’s probably character building to spend 2 hours on a turbo, but I didn’t particularly want that character. Even when warming up for races, I never bothered taking a turbo. I’d rather risk puncturing before a start of a race rather than get ridiculously sweaty and bored 5 minutes before the race started. The thing with a turbo is that as soon as you get on it, time seems to exist in a different dimension. 5 minutes becomes an hour, and one hour becomes a life sentence. You start clock watching as the seconds tick interminably slowly. Over the years, I did make the odd perfunctory attempt to master the art of the turbo. I’d make bold intentions of a good one hour session, but invariably, after 20 minutes, I’d reduce it to just half an hour, and that would be my turbo session done for the month. Last year I threw away my turbo session. Not because it had worn away from overuse. I threw it away because it was hopelessly rusty. It was an embarrassment and a reminder of how little my £100 had been used. In fact when I calculate the cost per hour of that turbo – it wasn’t just incredibly boring, but also very expensive for those minutes of torture. Despite being the world’s worst turbo user (though I’m sure some readers will challenge me for that title) I felt compelled to buy another one. A cyclist without a turbo is like a triathlete without his sleeveless top. 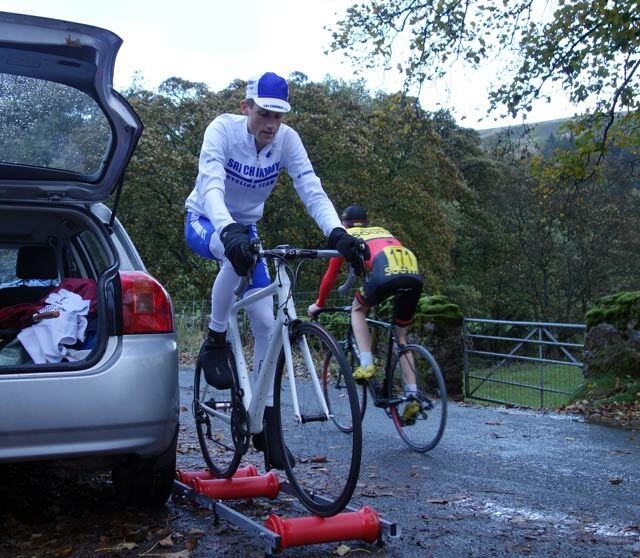 To be fair to my turbo, I did need it for warming up for the national hill climb in 2013 – my rollers were slipping all over the place in the torrential rain. I may only use this turbo for one hour per year, but at least it can claim some justification for the money. What can explain this turnaround? Cycling in the ‘sweet spot’ is fun. Endurance training is still pretty boring on rollers. But, if you have a sweet spot target, you have to concentrate on cycling at a decent pace. This takes enough concentration to keep the mind occupied. Time can actually pass quite quickly when you’re cycling in the zone. If you’re just stretching your legs, you will notice the same wall a lot more – but go really hard and who has time to look at the scenery? It really is miserable out on the roads. When stray dogs have recently knocked you off the bike, and you ‘re in the middle of the wettest January since 1910, you do slowly start to appreciate the benefits of a dog-free, dry environment. The conservatory wall may not be exciting, but it’s still more inviting than looking at the Portuguese tarmac or getting drenched in cold rain. I’m getting older. Perhaps as we get older our tolerance for cycling in circles increases. When the weather improves, I’ll probably be back out riding on the roads, but maybe not all the time. I quite enjoy these 1-2 hour sessions on the rollers. I do worry I may become one of these people who open conversations with talk about average power on turbo trainer sessions, this would be very worrying. But, if I can get some zone 3 fitness in the wettest January on record, God bless the turbo! My experience and view of indoor trainers is as much the same as you although over a shorter space of time. I’m afraid I’m not brave enough for rollers! The only way I can approach a session on a turbo trainer is to think of it as a “means to an end” and make sure I work up a real sweat. I change the resistance from time to time which could simulate a real ride (to an extent) which adds variety. You’re right, once you get going time just drifts by: I spent an hour on the trainer this afternoon and then thought I’d finish with a 5 minute cool down. Somehow that ended up being an extra 20 minutes! Hi Tejvan , have you ever looked into TrainerRoad, it makes turbo training almost enjoyable. Pretty sure you will have the required gear to give it a go. I absolutely loved your article on the Turbo! Glad to know that even you go through the same emotional rollercoaster as me when it comes to a turbo session.